Wash and soak the lentils for 2-3 hours. Grind it with ginger and salt into a coarse paste. Avoid using any water and only add 1 tsp or so if having trouble grinding it. The trick is to avoid using water as much as possible. You can add the chillies now to the batter or grind it while making the batter. Take a plastic sheet/plate, oil it well with vegetable oil. Apply oil/ghee/water to your fingers and make rounds of the batter - small lemon sized and place it on the sheet. If you are trying to make it for the first time, it is advisable to oil your fingers instead of water since while placing the fritters in the oil, the water may cause oil to splutter out. Press the round into flat disc - not thin, using your finger tip, make a small hole in the middle. You can skip making a hole too. Since the plastic is oiled, it will easy to slide it slowly into the hot oil for deep frying. You can either mildly slide it into the oil, or first place it first in your hands and then to oil. Whatever works. Once one side is done, the Vadai's will automatically float to the top. Turn them over and fry them until golden brown in color. Take care to see that the oil is not too hot nor cold. Too hot, the Vadai's will be done on the outside and not inside. 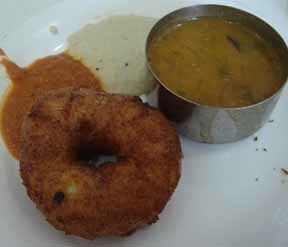 If oil is not hot, Vadai's will be soggy. Make sure that oil is hot first and after dropping the Vadai's, lower down the oil a little.